CENTER VALLEY, Pa., January 5, 2011 - Olympus today unveils the full-featured SP-610UZ, a lightweight, 22x wide-angle ultra-zoom camera with HD Video capability, delivering the celebrated strengths of this pioneering family of cameras: sophisticated long-zoom, go-anywhere photography. The SP-610UZ packs fun features and superb image quality in a user-friendly camera, providing further proof that Olympus lets you capture it all. 3D Photo Mode - captures two shots of a scene from two different angles to create still photos that can be viewed with the added excitement and realism of 3D. AF Tracking - tracks a moving subject automatically and keeps it in focus for optimal image quality. The SP-610UZ packs a 22x wide-angle optical zoom lens into a compact, easy-to-hold body. With an f2.8 (Wide) / f5.6 (Tele) wide-angle lens providing the equivalent of a 28-616mm focal length, users can get closer to the action with zoom performance comparable to that of a 500mm equivalent telephoto lens for Digital Single lens Reflex (DSLR) cameras. The wide-angle lens makes it easy to take a picture of the entire stadium, while the powerful zoom lets you focus on your favorite player. Whether capturing fast-action, life's everyday snapshots or HD videos, this S-series camera provides the versatility to get the job done like never before. The SP-610UZ is equipped with in-camera Magic Filters that enable users to enhance and customize images as they're being captured. Have more fun and get more flexibility without expensive and time-consuming computer software. Magic Filter Movie is a new feature that allows you to apply Magic Filters to your high-definition movies, taking them to a new level of artistic expression. New! Punk - create two-tone images full of rock-and-roll spirit. The SP-610UZ shoots gorgeous 720p HD video, so you'll always capture the moments you cherish in clear, crisp high-definition at the touch of a button. With HDMI Control, playback also is a breeze. Gone are the days of friends and family huddling around your camera's tiny LCD to see the pictures and movies you just captured. Now, you'll be the hit of the party or any family event when you proudly display your brilliant images and movies on high-definition televisions. Simply connect the camera to an HDTV with an optional HDMI™ cable. With HDMI Control, you can use your HDTV's remote to control playback functions and navigate the camera's menus from the comfort of your couch. The SP-610UZ boasts a bright, 3.0-inch LCD monitor, an upgrade over its predecessor, the SP-600UZ (2.7‖ LCD). Ideal for viewing, composing and sharing all your favorite images and HD videos. Dual Image Stabilization combines two technologies - Mechanical Sensor-Shift Image Stabilization and Digital Image Stabilization - to provide one powerful anti-blur solution for capturing great images whether the photographer or the subject is moving. Olympus' mechanical Sensor-Shift Image Stabilization keeps images sharp by adjusting the internal image sensor to compensate for camera movement, even in low-light conditions when shutter speeds are slower. Additionally, Digital Image Stabilization freezes the action with high ISO sensitivity and fast shutter speeds to prevent blurry images often caused by a moving subject. The places you can take the SP-610UZ--national parks, weddings, sporting events or city streets--are locations where you want to capture as much of the scene as you can. In-Camera Panorama mode makes it possible by capturing three images and stitching them together to create one amazing panoramic picture. Simply press the shutter button and slowly pan across the scene. The second and third images will be captured automatically and stitched together with the first image - resulting in one seamless panorama-size picture. To create the ultimate panorama, consumers can use the OLYMPUS [ib] Software to stitch up to 10 images together. Wedding, team shots and family reunion photos have never been easier with Face Detection. The SP-610UZ detects up to 16 faces within the frame and automatically focuses and optimizes exposure to capture sharp, brilliant portraits and group shots. Even more remarkable, the SP-610UZ comes equipped with Beauty Mode. Designed to touch up the appearance of your subject's skin as the photo is captured, enhancements that typically would necessitate retouching in a graphics editing program. AF Tracking technology locks focus on your fast-moving subject - everything from house cats to Siberian tigers - and continuously adjusts focus and brightness. This enables you to keep quick-moving and unpredictable subjects like kids and pets in focus for the perfect shot. There's even two newly designed ―Pet Modes‖ for animal lovers, offering the ability to recognize the faces of a variety of breeds of both cats and dogs. Taking a moonlit stroll on the beach? Intelligent Auto Mode automatically identifies what you are shooting (i.e., Portrait, Night + Portrait, Landscape, Macro or Sports) and adjusts the camera's settings to capture the best quality results. Amateurs can jump into this quick and hassle-free feature that does the thinking for them and produces incredible images. Whether you are globetrotting or attending a sporting event, the SP-610UZ offers a 14-megapixel sensor, enabling consumers to achieve consistently sharp and vivid images when producing large-format prints or cropping/enlarging a portion of a photo. Olympus developed its exclusive TruePic III+ Image Processor for the demanding performance of DSLRs and has migrated the technology to the S-series cameras for amazing image quality. Olympus' enhanced TruePic III+ Image Processor produces crystal clear photos using all the pixel information for each photo to deliver exceptional clarity with more accurate colors, true-to-life flesh tones and faster processing speeds. TruePic III+ also captures crisp, clear photos at high ISO settings, which are traditionally associated with increasing noise or producing grainy photos. All Olympus digital compact cameras now offer the new OLYMPUS [ib] photo organizing and editing software. It includes photography workflow, browsing, editing and unique photo organizing functions. You can organize photos by person with automatic face-recognition technology, by place with a map-tagging function, or by event. All information will be tagged in each photo's data. You can then easily upload images to the integrated online service, [ib on the net], to share and backup photos, as well as order prints and photo merchandise. The name [ib] stands for image bridge, because the software is designed to create a bridge to help you get images from your camera to services where you can do more with your photos. 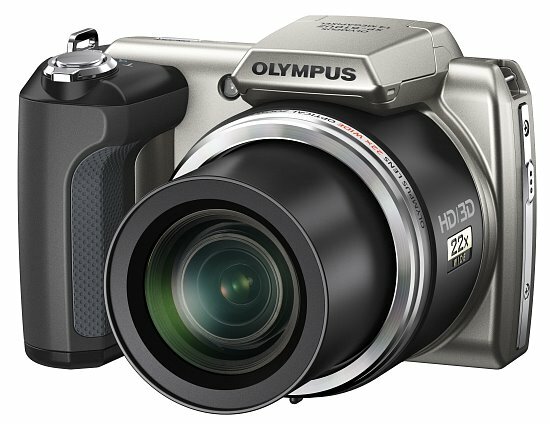 Olympus' new spring 2011 digital compact cameras have SD compatibility for up to 32 gigabytes of capacity. Journalists interested in more information, review units, product specifications and high-resolution images of the new SP-610UZ should contact Jeff Hluchyj, Mullen Public Relations, 617-226-9939 or [email protected], or Jennifer Colucci, Olympus Imaging America Inc., 484-896-5719 or [email protected] or the Olympus Web site: www.getolympus.com.